Posted on Monday, April 4th, 2011 at 10:56 pm. Taiwanese American lawyer and National Guardsman goes to London and ends up learning from one of the best bartenders there. He returns to New York and opens two of his own establishments, the Royal Oak and Sweet Ups, in New York’s hipster Williamsburg neighborhood. Now, his third venture is a high-end classic French speak-easy serving drinks such as Whisky Tango, Toussaint Rouge, and… Taiwan Beer. Yep. The one and only, Taiwan Beer. And, that’s how Benjamin Shih, co-owner of the new Lower East Side’s swanky Hotel Chantelle, came to our attention earlier this year. Apparently, this is the only location in Manhattan that serves Taiwan Beer. 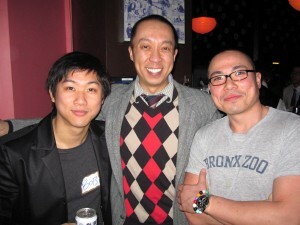 We are pleased to share an interview conducted by Athena Chang, the Social Chair of Taiwanese American Professionals in New York (TAP-NY), and adapted for TaiwaneseAmerican.org. A: Your cocktails have very unique ingredients and are super flavorful. How did you come up with the mix and what is your personal favorite? B: I love outstanding classy cocktails. Nowadays people are used to these drinks that have 10 ingredients in there. They tend to lack consistency. For me, I like the cocktails that balance classic flavors and consistency. For example, Stingers, High Ball, Sours, Collins, to name a few. A: I’ve heard that you plan on expanding Hotel Chantelle quite a lot. 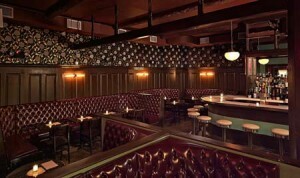 Since the last TAP-NY happy hour at Hotel Chantelle, what changes have been made or are on the way? B: We are rolling out food in two to four weeks. We are also opening up the basement, aka the Sargeant, for private parties and dancing. In addition, we are also opening up the rooftop, which is four times the size as the main floor, for dining. It is going to be open 365 days a year. It will have heaters in the winter or rainy night like tonight and amazing views of Manhattan Bridge when it is nice and clear out. A: What can I expect from the food menu? Do you have a favorite dish? B: It will be Colonial French food. The kind of food you expect from French ships that come to the port. We are also going to have brunch on the weekends. We are still experimenting with the menu but I love poutine. A: Tell me about your experience growing up in the Midwest as a Taiwanese American. B: When I grew up, I only saw Chinese of my age at Chinese school or at the supermarket. There weren’t many Chinese where I grew up in Detroit. A: How many tattoos do you have? What do they mean to you? B: I have a lot but some are not even finished. I guess from where I grew up, it was natural to have some tattoos on you. A: How did you get into the restaurant/bar business? B: It all started with my first job working at a bar back in college. After I finished my degree, I went to practice law specializing in intellectual property law working in California. Then I got sent to London for a few years. I decided to do something different and the bar business is the only other business I am familiar with and interested in. So I used the bonus from my last job to open up Sweet Ups and then six months later I opened up Royal Oak. A: How did you end up serving Taiwan Beer at Hotel Chantelle? B: Because Taiwan Beer was everywhere in my childhood! 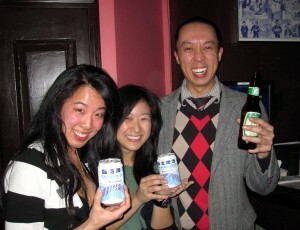 When I grew up, Taiwan Beer was in almost all the family pictures! I knew I had to serve Taiwan Beer. A: I heard you might have to go back to the battlefield this year. What is the update? B: I haven’t heard anything yet. Knock on wood. Until then, I will be here, running the bars, preparing food and enjoying my daily cocktail! A: What is your most memorable experience from being in the U.S. military? B: Actually, I remember most about basic training. They ask you basic questions that you don’t really notice until they point it out. I remember they asked us, “Who doesn’t know how to swim? Raise Your Hand.” “Among those who have your hands raised, who lives in the city?” “For those people, who lives in low income housing?” It is interesting to see the connection between the access to swimming pools and income status. A: Where do you like to hang out in the city? B: I firmly believe everyone works very hard in the city and therefore, everyone needs to recharge and unwind. Everyone chooses different ways to recharge themselves. Some people choose to eat, some drink, some go out partying. For me, it is hands-down to read. I would buy five to seven books a week and finish three to four books. I did switch to the Kindle now so I don’t have to carry my books around. A: What is the last book you read then? B: I read “The Wise Man’s Fear” by Patrick Rothfuss. It is about this adolescent growing up to become a man. The book talks about the basics of life – romance, music, friendship and it is just amazing. A: Hotel Chantelle is your third venture so far. What’s next? A club? B: This time next year exactly this day I am going to take a proper vacation to Las Vegas to participate in the World Series of Poker Tournament. If I do win, I will donate 50% of the profit to my girlfriend. Haha! A: Tell me more about your experiences as a successful Asian American, and specifically Taiwanese American, bar owner in New York City? Were there any challenges that you faced breaking into this industry? B: There are many challenges. First of all, when you think of Asians, you don’t equate them to nightlife leaders, trend setters or early adopters really. Secondly, most people don’t know what Taiwan is. They don’t know the difference between Taiwanese and Chinese. They are confused by the People’s of Republic of China and the Republic of China. In addition, there is the stereotype of Asians being doctors, lawyers, engineers or geeks. Also, first generation Asian Americans tend to work or open restaurants so their children don’t have to. Now I am going back to the restaurant/bar business. I want to introduce Taiwan to [the public]. I feel like everybody knows what China is, what Hong Kong is and what Macao is. But Taiwan seems like a lost demographic to a lot of people. Check out Hotel Chantelle for their delicious classy drinks as well as their upcoming food menu. I had the opportunity to sample their testing menus and they are delicious! I can’t wait till they roll out the official menu so I can dine on the beautiful rooftop of theirs. Hotel Chantelle is located at 92 Ludlow Street, New York City.